Published: Dec. 2, 2018 at 03:57 p.m.
Los Angeles Rams defensive tackle Aaron Donald splits double team to strip-sack Detroit Lions quarterback Matt Stafford. 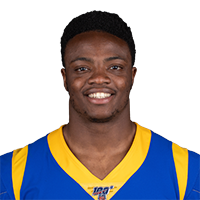 Published: Nov. 20, 2018 at 01:21 a.m.
Los Angeles Rams linebacker Samson Ebukan recovers a forced fumble and scores a touchdown for 11 yards. Los Angeles Rams linebacker Samson Ebukam intercepts Kansas City Chiefs quarterback Patrick Mahomes and runs it in for a touchdown. Published: Nov. 20, 2018 at 01:20 a.m.